Some time ago, I described the available libraries for carrying out cheminformatics in R. Much of this work has been carried out by Rajarshi Guha, who has developed the R packages RCDK, RPubChem and fingerprint. Now's your chance to have a masterclass in the use of these packages because Rajarshi is going to be giving an intensive workshop on their use in May at the EBI. Information on the workshop is available on its webpage, but all you need to know is that it costs a whopping £25 per day (the second day is on metabolomics and R) and you might want to book early. I already have. See you there! A very brief overview of R from a programming and application point of view. Will look at some basic programming constructs and then survey packages that are useful for cheminformatics problems. This session will also briefly touch on RDBMS access from R.
An overview of CDK functionality. This will be relatively high level and will not go into the nitty gritty details of Java programming. Will serve to highlight what can (and cannot) be done from R.
Reading and writing chemical structures from various sources and in various formats. What does I/O entail in the CDK programming model? How does it affect working in R? Once we have a set of molecules, what can we do with them? We’ll cover accessing atoms and bonds, setting and getting properties on molecules and so on. I’ll discuss accessing the various fingerprint methods of the CDK and manipulating fingerprints using the fingerprint R package. I’ll also address reading fingerprint data from files generated by other programs. QSAR modeling is a common cheminformatics task. Key to developing QSAR models is the evaluation of molecular descriptors. In this session, I’ll cover the available types of descriptors and how one evaluates them. We’ll then run through examples of developing QSAR models, starting from molecule loading and ending at a final model. Getting chemical structure and bioassay information from PubChem using R. This section will overview the functions that let one retrieve structures, assay information and assay data. I will also highlight current limitations in terms of data size and ways around these limits. This session will highlight how one might go about extending the package – either by wrapping calls to the CDK in R or by adding your own Java methods and then calling them. Some time ago I described the (unofficial) RSS feed I developed to keep up to date with the Computational Chemistry List (CCL.net). If you were subscribed to that feed (and Google Reader tells me that there were 40 people at least following it) you may have noticed that it has not been updated since mid January. This was due to my use of a domain name which has since lapsed. Not to worry, just resubscribe to http://feeds.feedburner.com/ccl with your favourite feed reader, and all will be well again. By the way, if you're interested in subscribing to Indiana University's cheminformatics list (CHMINF-L), I've just realised that there's an RSS feed provided in the bottom right of the archive page. Now you can free your inbox and still keep up to date with these high-volume lists. 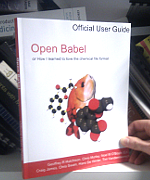 You can use the 'babel' program provided with OpenBabel (on Windows as well as Linux) to search in a database for molecules similar to a particular query. The full details are in the Fingerprint Tutorial on the OpenBabel wiki, but here is a case study using ChEMBLdb which is available as an SDF file of 517261 molecules. Note that we are using the default OpenBabel fingerprint for all of these analyses. This fingerprint is FP2, a path-based fingerprint (somewhat similar to the Daylight fingerprints). (2) After unzipping it, make a fastsearch index (this took 18 minutes on my machine, for the 500K+ molecules).